Habaki :On the silver plate, bamboo, dragonfly and insect are engraved. Blade length : 69.8 cm or 27.48inches. Width at the hamachi : 2.8cm or 1.1 inches. Width at the Kissaki : 2.05 cm or 0.81inches. Kasane :0.6 cm or 0.236inches. Shape : Osuriage Mumei Katana. Boshi is long. nice shape Katana. The Hada is beautiful. There are Utsuri. Hamon : Nie Deki, Suguha. There are Ko-Ashi. The Nioukuchi is thick. Boshi is Hakikake style. a divided Emperor family in the Namboku-cho period. the Kikuchi family and came to an end in the Age of Provincial Wars. This blade is typical Rai school, nice Suguha Hamon. with gold color. The rim is painted with gold color. Fuchikashira: Shakudo Nanako, Ume tree is engraved with gold color. Kogai: Shakudo Nanako, ears of rice are engraved with gold color. 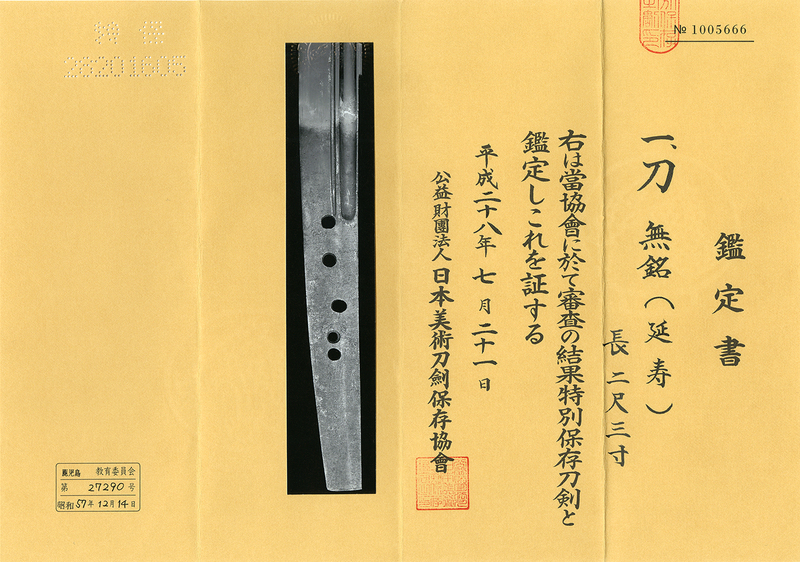 From Aoi Art: This blade has nice clear blackish Jigane with Utsuri.